There were so many things that made me need to pick up and read this book, including the fact that I really enjoyed Ruth Ware's In a Dark, Dark Wood, so having this book compared to that one really got me excited, I've been on the hunt for a truly "twisty, psychological thriller", and including a podcast and the media as key points within that thriller had me intrigued as to just how that would work. 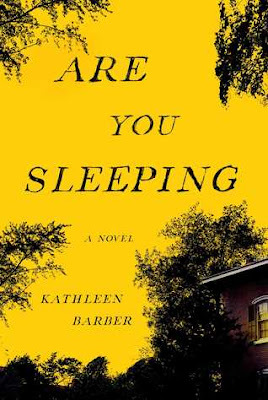 Are You Sleeping has such an interesting, unique concept for a thriller and, while I'll admit it wasn't quite as thrillingly paced as I was expecting or hoping, it was quite successful in building a mystery based on an unreliable witness to a murder and keeping me guessing until close to the end. I have to admit that, in the beginning, I wasn't much of a fan of our main character, Josie Buhrman. What kind of person would start building a new life with someone they profess to love without even telling them their true name? Who would bald-face lie about their parents being dead and then say their aunt had died just so they could go to the funeral of the mother they said had been dead for years? Then I learned just how twisted and dysfunctional the Buhrman family actually was and it was kind of understandable why she, at least early on, didn't tell the truth. Having your father murdered and your mother disappearing to go live with a cult across the country is bad enough. Then having your twin sister - the person you loved more than anyone else and the only person to see what really happened to your father - not only completely shut you out of their life but actively do things to devastate you is almost too much to handle. But when Poppy Parnell (a truly odious character that will exploit anything and anyone for some fame) gets inside Josie's head and forces her to confront the facts of her past, the truth that unravels is even worse, leaving you to question whether it's better to know the truth or to just believe the lie. Lanie, Josie's twin, is a deliciously unreliable character, which makes you question everything she says and does and therefore leaving you guessing as to what she really saw and what really happened to their father. I won't go into details as to the myriad of ways she betrayed Josie as well as their aunt, but believe me when I say it's pretty bad. She's violent, easily unhinged, and incredibly manipulative. So how can anyone believe anything she says? Therein lies the great mystery and I loved trying to figure out what happened and whether Lanie was actively lying to everyone, telling the truth, or somewhere in between. I think my favorite aspect of the story was the attention given to Poppy's popular podcast questioning Lanie's statement that she saw the teenaged next door neighbor murder her father and the social media firestorm that results from it. There are snippets of Twitter feeds, Redditt comments, and transcripts of Poppy's podcasts interspersed within the narrative and these aspects ask questions that make the reader think about what the answers might be (which is what gets Josie questioning her sister's statements and actions as well) as well as show you just how vicious outsiders can be when safely commenting and analyzing something that has nothing to do with them. As horrid as Poppy is she is really the catalyst that keeps the story going and the reason they discover the final straw that reveals the truth of what happened that night. I've not read a novel that quite employs media in this way and I really enjoyed it. My only issue with the story is that it wasn't quite as thrilling as I was expecting. When I think of a twisting, psychological thriller I tend to think of chapters ending in cliffhangers and huge, anxiety-inducing moments that have you on the edge of your seat. This story is more of a slow release mystery that keeps you wondering and guessing, but not a story that makes you race to the finish line. Are You Sleeping is an inventive mystery that keeps you wondering where the line is between the lies and truths being told. All of the characters are complicated and most are trying to hide something, even if it has nothing directly to do with the murder at the center of it all. I really enjoyed the layout of the story and I'm interested to see if the author uses this same format in future novels. I definitely recommend for those that enjoy mysteries with unreliable characters. It's okay. The yellow coloring and the typography gives it an eerie feel and the far off-center house makes you feel off-kilter as well. For much of the story you don't really know what happened within that Buhrman household, so that little peek of a window makes you wonder what you might see if you looked inside, or what Lanie might have actually seen when she looked out. Thank you to Gallery Books and Netgalley for providing me with a free copy of Are You Sleeping in exchange for an honest review. All opinions are mine alone. For more information about the book, including other reviews and links to where you can purchase a copy, please see Goodreads HERE.